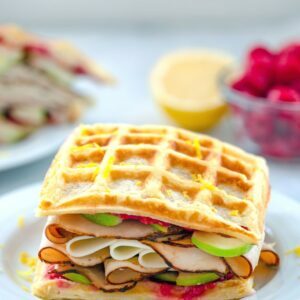 These Lemon Waffle Sandwiches are loaded with maple honey turkey, provolone cheese, and green apples, with a simple raspberry spread. They're perfect for enjoying during a late summer's picnic or any time of year! In a separate, larger bowl, whisk together buttermilk, lemon juice, lemon zest, eggs, and melted butter. Pour dry mixture into wet mixture and stir until just combined, being careful not to over-mix. Heat waffle iron and spray lightly with cooking oil or brush with canola oil. Pour batter into waffle iron, close iron, and let cook for 3-5 minutes, until waffles are golden. In a small bowl, mash raspberries with a fork. Spread mashed raspberries on one side of each waffle. Layer honey turkey, provolone cheese, and sliced green apples on two waffles and top with the remaining two waffles.